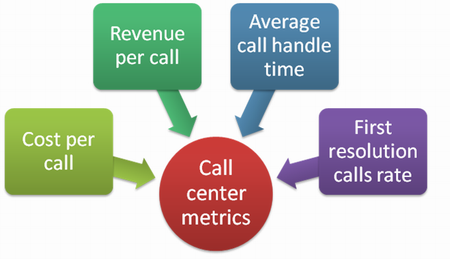 What call center metrics are really worth measuring? This question is not easy to answer. Nonetheless, each company should find a solution to this problem the sooner-the better. This is because modern technologies allow customers get access to lots of choices, so the more effective and popular your contact center will be – the more clients will be attracted to it and the greater amount of sales it will eventually generate. With proper metrics and key performance indicators in mind, your organization will find it easier to track, measure and analyze the most critical factors that affect your business. As a result, it will be simpler for you to draw smart conclusions and make real-time decisions that will improve the performance of your call center and bring it to a brand new level. Call center metrics should always be considered in advance. Such decisions, however, should not be made in haste. Otherwise, there will be a risk of measuring the wrong things, which do not affect your business at all. What you should know is that all performance metrics may be generally subdivided into three groups. Business performance call center metrics are applied to help you reach your business objectives. Operational metrics are used to review the way your call center operations help achieve the pre-set business objectives. Individual or agent performance metrics are implemented to drive the operational performance metrics, which, in their turn, boost business goals. Let us discuss what metrics exactly are included into each category mentioned above. Business performance metrics comprise such KPIs as Revenue per unit, Net Promoter Score, Customer loyalty and Churn rate. The second group of metrics (those that deal with operational issues) include the following key performance indicators: Sales, Quality support scores, Customer satisfaction and Cost of Operation. Individual or Agent performance metrics involve QA scores, Contact/Productivity handling indicators such as schedule adherence, efficacy of gent utilization, productive VS paid hours, attendance, amount of handled contacts, log ratio, time of call handling, percentage of calls on hold etc. Each contact center tends to choose those metrics, which seem to be crucial for a company at a given period of time. As a rule, the following indicators are measured in such organizations most often: average handle time, service level, number of incoming and outbound calls, staffing levels, customer and employee satisfaction, abandoned volumes etc. These metrics are those that can tell a lot about your business and its current performance.